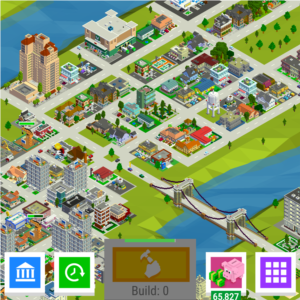 Android game Bit City by NimbleBit is an Idle Clicker (one that will continue to generate in-game currency even when the game is not running). This is similar to another recently reviewed game, Egg Inc, except with much better performance and the look and feel of SimCity or other metropolitan style city builder games. Bit City feature very basic graphics. But that being said, the clearly pixilated graphics work together well in a way that doesn't detract from the essence of the game. In fact, such poor graphics likely contribute to the fast performance and better battery life that Bit City offers. Though the core gameplay of Bit City is very similar to the handful of other Idle Clickers such as Egg Inc and AdVenture Capitalist (both of which I previously reviewed), the main difference is the theming and available upgrades. In fact, it's so similar that I nearly deleted the game once I realized this was the case. However, there is one difference in that a building can be marked as historical so that the look of the building remains the same, which is nice for those trying to build a tall skyscraper city. There's also a nice screenshot feature, which tilts the gameplay to provide a sideways view for your screenshot. However, I'm a sucker for City Builder games and had to give it a go. I purposely resisted "reseting" the game because I know how dull the game can become when being replayed, but at higher in-game currency values. But at some point, the "reset" had to be done and I immediately regretted it at that moment and deleted the game. Also a nice feature to Bit City is when you move onto the next city, you still continue to gain profit from the previous level you played. In many other Idle Clicker games, moving to the next level (not to be confused with a reset), is a completely new game and all previous progress is negated. A good game to play during short moments of downtime, even if you don't have internet. For this type of game and compared to my past experience, Bit City had the best performance. Once the game got going and I was earning plenty of money without actually playing, I didn't see any change to battery life on my Nexus 6P, unlike with Egg Inc. I think the only time the game requires internet is during startup and when the player opts-in to watch a video advertisement in return for some in-game benefit. The rest of the game can be played without internet, which also helps to improve battery life. Make sure to upgrade your "Game" with the green dollars wisely, as that currency can either be purchased or slowly accumulated actually playing the game. My go to choice for "Game" upgrades is to improve upgrades that related to how much money you make while the game is Idle: Day Trading, Smart Grid, Market Gains. These are generally more expensive, but will allow for greater gains while you're not actually playing, which is going to be a majority. Upgrading a building is free and will increase how much you make. But this only happens when actively playing the game. However, there are some upgrades that will automatically initiate building upgrades. Make sure some of those happen so you can focus your time on clicking cars, boats, and airplanes for money. It's ideal to do all upgrades to a city before moving onto the next. This is because the bank from these other previously completed cities are part of your regional network which still earns you money in later cities. That is until you do a reset. If you're going to "reset", I suggest doing it around 100 Prestige points. Doing so will help you move along the game fastest, but will also require a lot of "replaying" of the same game. Overall, the game is enjoyable and one that nice to have around for a quick game. However, I found myself playing it multiple times a day and like most Idle games, it became very repetitive. Searching and clicking for vehicles in a small city wasn't a problem, but as the footprint of the city grew, searching became more painful. "Reseting" the game to put Prestige points into play turned out to be the mistake that convinced me to delete the game. In my mind, being the 3rd Idle style Android game I've played, this has been enough.